Figure 1. 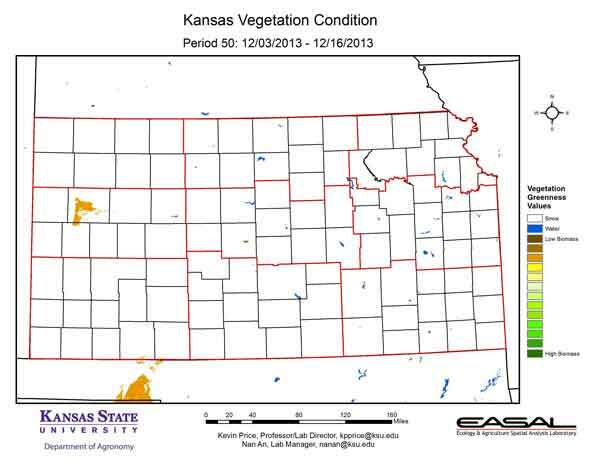 The Vegetation Condition Report for Kansas for December 3 – 16 from K-State’s Ecology and Agriculture Spatial Analysis Laboratory shows that most of the state had an early dusting of snow. Unfortunately, the liquid equivalent for the snowfall was limited. Statewide, the first half of December averaged just 9 percent of normal moisture. Figure 2. 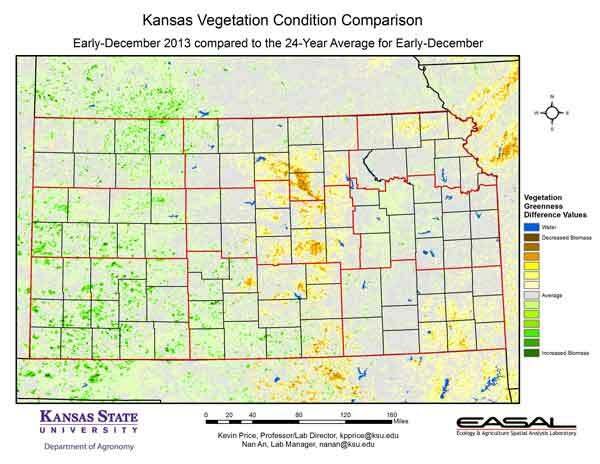 Compared to the previous year at this time for Kansas, the current Vegetation Condition Report for December 3 – 16 from K-State’s Ecology and Agriculture Spatial Analysis Laboratory shows that Central and Eastern Divisions have lower biomass production. The greatest increase in NDVI values are in south central Kansas, particularly in Barber and Harper counties. Figure 3. 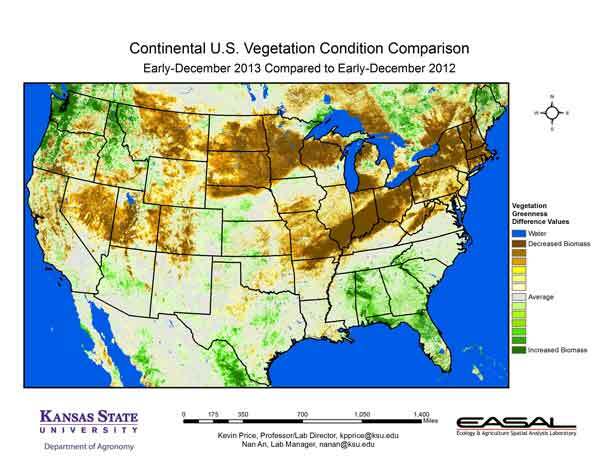 Compared to the 24-year average at this time for Kansas, this year’s Vegetation Condition Report for December 3 – 16 from K-State’s Ecology and Agriculture Spatial Analysis Laboratory shows that most of the state has very close to average photosynthetic activity. The biggest area of below-average activity is in Ottawa County, in north central Kansas. This area had a heavier snow total from the last weather system in this two-week composite period. Figure 4. 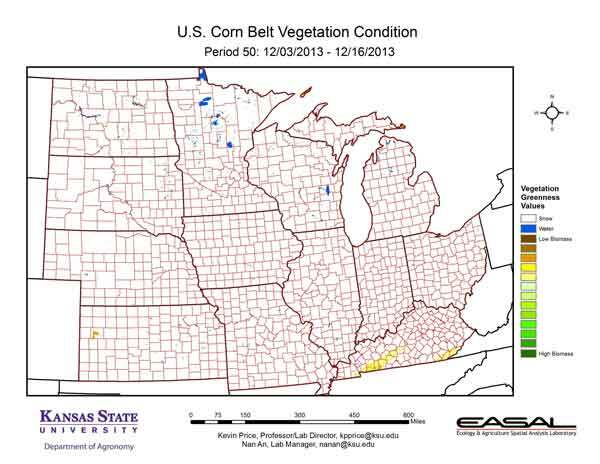 The Vegetation Condition Report for the Corn Belt for December 3 – 16 from K-State’s Ecology and Agriculture Spatial Analysis Laboratory shows that snowfall penetrated the entire region. The greatest amounts occurred in the northern stretches of the region. In the northern Great Lakes area, snow depths averaged 2 inches, ranging from zero to 14 inches on December 16th. Figure 5. 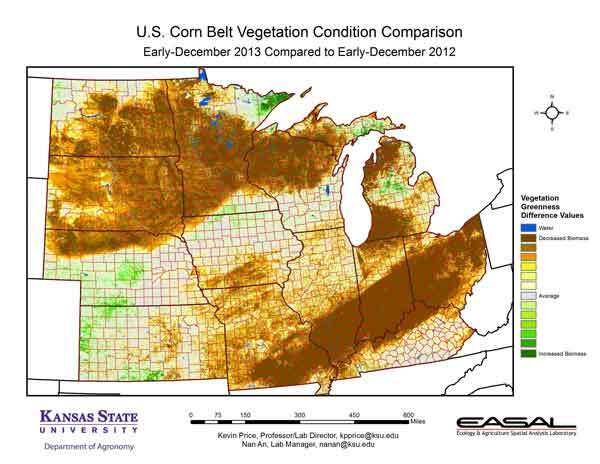 The comparison to last year in the Corn Belt for the period December 3 – 16 from K-State’s Ecology and Agriculture Spatial Analysis Laboratory shows that a large area to the north and to the south of the region has much lower NDVI values. This corresponds to areas of greatest snowfall. In the southeastern part of Missouri, Marble Hill reported 8 inches of snow on the ground on December 7th, while Sioux Falls, S.D. still had 5 inches on the ground on the 16th . Figure 6. Compared to the 24-year average at this time for the Corn Belt, this year’s Vegetation Condition Report for December 3 – 16 from K-State’s Ecology and Agriculture Spatial Analysis Laboratory shows that snow-covered areas have little photosynthetic activity visible. There are higher-than-average values in northern Iowa and southern Wisconsin, where the snow pack has been less persistent. Mason City, Iowa reported only 2 inches on the ground on the 16th, while Berlin, Wisconsin had 3 inches. Figure 7. 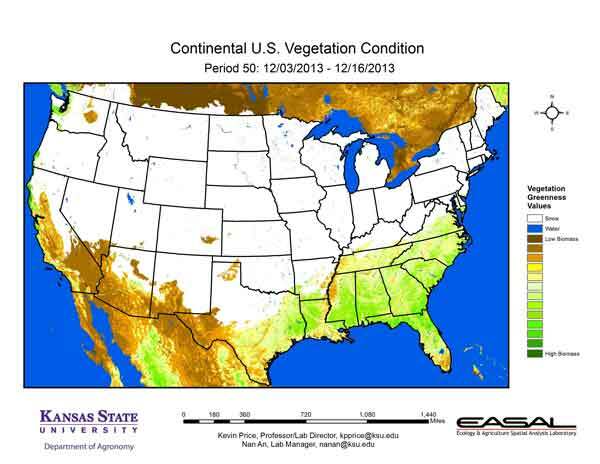 The Vegetation Condition Report for the U.S. for December 3 – 16 from K-State’s Ecology and Agriculture Spatial Analysis Laboratory shows that the snow and ice penetrated to Texas and Arkansas. Dallas Love Field reported 2 inches on the ground on the 6th. Figure 8. The U.S. comparison to last year at this time for the period December 3 – 16 from K-State’s Ecology and Agriculture Spatial Analysis Laboratory shows that areas with greater snow cover have lower NDVI values, while those with lower snow packs have higher NDVI values. The lack of snow cover in the Pacific Northwest is of increasing concern. For example, in the Inner Mountain regions, the snow cover extent is only 52 percent, with an average depth of 2 inches. Last year, the snow cover extent was 64 percent, with an average depth of 4 inches. Figure 9. 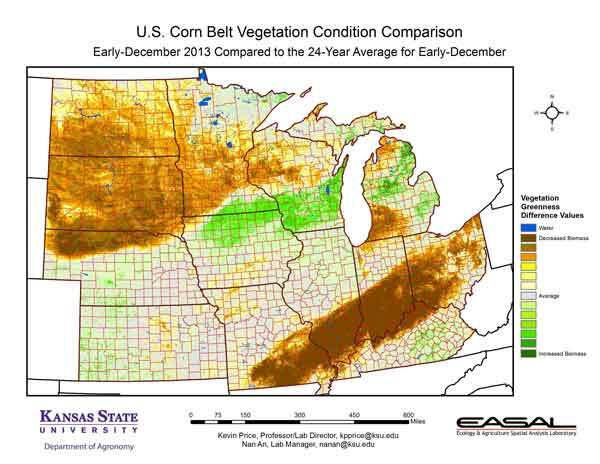 The U.S. comparison to the 24-year average for the period December 3 – 16 from K-State’s Ecology and Agriculture Spatial Analysis Laboratory shows that the biggest departures from average are in the Northern Plains and in a band from southern Missouri to central Ohio. This aligns with an area of extended snow and cloud cover. The lack of snow cover and continued vegetative activity are bringing rising concerns of drought in the Pacific Northwest.